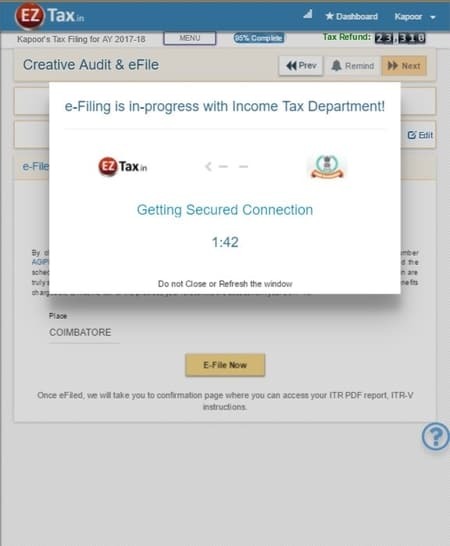 Now, e-filing is just a breeze, will take just few secs. EZTax.in made enormous efforts in making ultra fast efiling with income tax department along with an acknowledgement number. In addition, system will generate an email with post filing instructions along with your primary and acknowledgement information to facilitate a quick online eVerificiation. Gone are the days to post ITR-V forms to CPC - Income Tax Department, all you need is follow any of the 6 options for a smooth e-Verification. Once e-filed, you can visit EZTax.in to download your customized ITR report in PDF format, along with other information.